With synthetic turf fields becoming a mainstream solution for all types of organizations, the customer often gets caught up with the turf systems that are being presented to them and often neglects the precise work required to get the area prepared for the turf installation. Deluxe Grading was formed as an arm of Deluxe Athletics to be able to offer its clients a full service solution from start to finish which is unmatched by other firms in the industry. 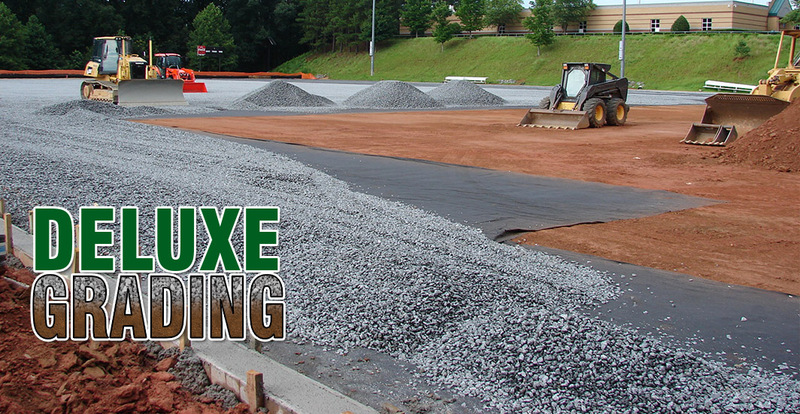 Working with its own experienced personnel, Deluxe Grading has the capabilities of handling any size project required, with superior management of only the highest quality subcontractors as necessary. While many other firms will simply work with the "best price" they receive, Deluxe Grading will always provide the "best value" to the customer while being involved in a hands on process from start to finish. The base of the field is an integral part for the longevity and performance of the field. Deluxe Grading will only use, as well as approve its subcontractors to use, the highest quality of materials installed at precise standards above and beyond that of the industry. With our team and contacts, we also have the ability to work on natural grass fields in conjunction with our synthetic projects which ultimately saves the client time while being very budget friendly. The ability to handle the site preparation, in conjunction with our in house project managers and turf installers, the client will always have one point of contact from start to finish and beyond.